Zach Husted of Frisco demonstrates bikepacking while at Rainbow Lake on Tuesday, May 15, in Frisco. Husted went on an 11-day, 539-mile trip on and around the Colorado Trail via his mountain bike late last September. 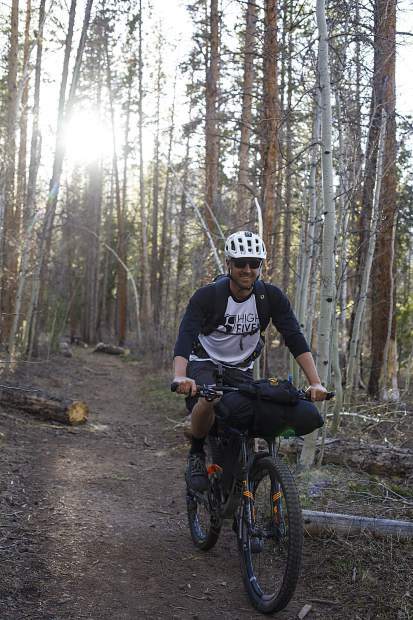 Zach Husted demonstrates bikepacking while at Rainbow Lake on Tuesday, May 15 in Frisco. Husted went on an 11-day, 539-mile trip on and around the Colorado Trail via his mountain bike late last September. 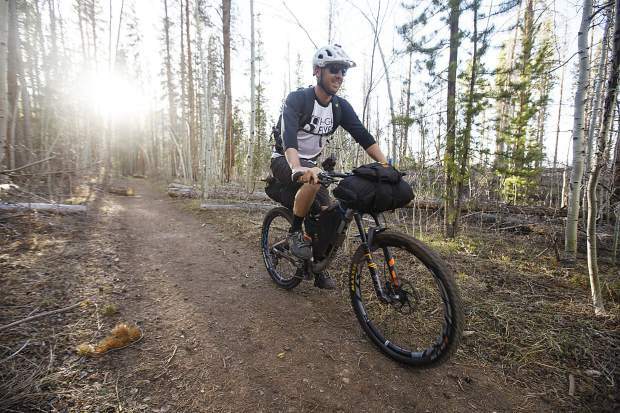 Zach Husted raises his 40-pound bikepack during his 11-day, 539-mile trip on and around the Colorado Trail via his mountain bike late last September. 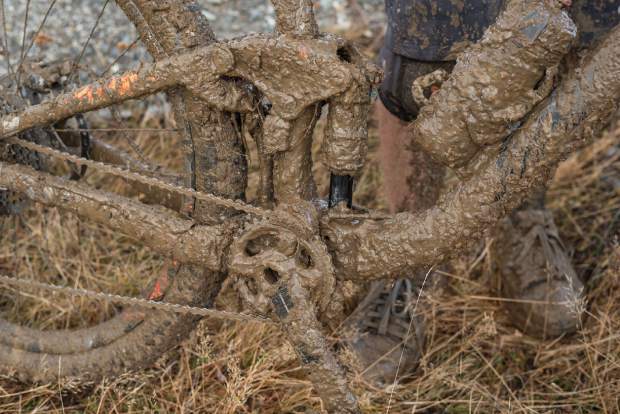 Zach Husted's 40-pound bikepack is covered in mud during his 11-day, 539-mile trip on and around the Colorado Trail via his mountain bike late last September. Zach Husted's 40-pound bikepack is seen resting at Kokomo Pass late last September. Husted went on an 11-day, 539-mile trip on and around the Colorado Trail via his mountain bike late last September. Five weeks is the average time it takes for a hiker to traverse the entire 485-mile Colorado trail by foot. By bike, Frisco’s Zach Husted completed his own 539-mile journey on and around the trail in 11 days. And he did it alone. For the avid 28-year-old backcountry snowboarder, the late September trip from Denver to Durango provided him with a solo experience deep in some of the state’s most stunning landscapes. And in this modern outdoors world of ever-evolving technology and a growing number of ways to experience the backcountry, it also provided Husted with the opportunity to soak it all in at a much faster pace. This early autumn adventure wasn’t Husted’s first bikepacking attempt. He attempted it previously in New Zealand. But on that trip, Husted also had the benefit of an old self-contained eight-seat Japanese work vehicle to aid him. It came equipped with a full-sink, restroom, queen bed and bike mount that enabled him to explore all of the country’s enduro trails. Back here in Colorado before he departed Denver for Durango, Husted had never bikepacked more than two to three nights. But he was inspired to attempt the 11-day trip to raise more than $2,000 for the nonprofit High Fives Foundation. 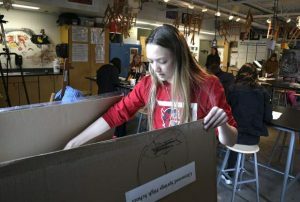 It’s a Truckee, California-based organization that raises injury prevention awareness for outdoor athletes while providing resources to those who suffer life-altering injuries outdoors. After departing from Denver, it was just a few days before Husted entered into familiar territory here in Summit County via Georgia Pass. It was entering Summit County when Husted had one of the greatest moments of his trip, at Georgia Pass. After an 80-mile, 14-hour day he crested the pass as sunset neared. 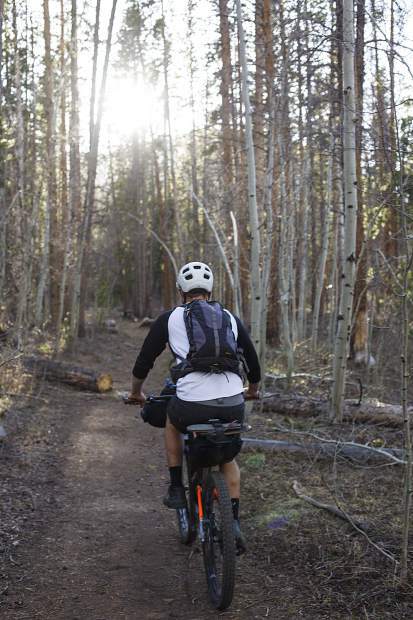 But considering the time of year of his bikepack — when much fewer people are at these early locations on the trail — and considering that the spot where he planned to restock for lunch earlier in the day was closed, his arrival into Breckenridge was a battle with his own energy levels. Though he was calorie-deficient and alone, the sunset moment helped to power Husted through. 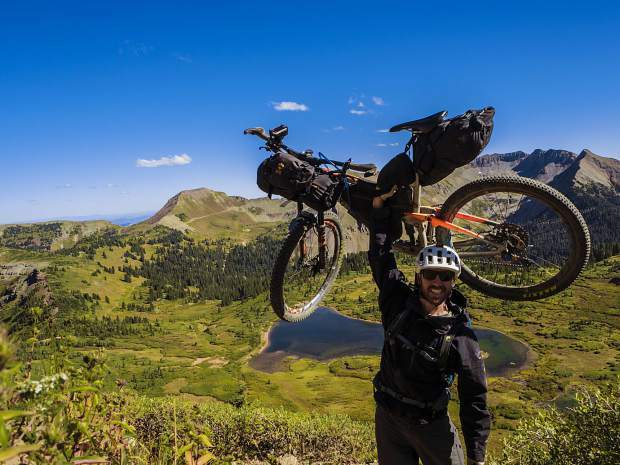 The next day, he ascended the toughest stretch of his bikepack here in Summit County, weaving up through the Tenmile Range’s Peaks 4 and 5 before dumping over the base of Copper Mountain before heading up through Leadville. 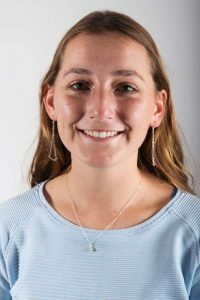 Being on a bike may have helped Husted traverse the county at a quicker pace than a hiker, but it didn’t make it any less grueling. And, in some ways, it was tougher. To get through these difficult stretches of the journey, Husted prepared thanks to lessons learned during his previous bikepack in New Zealand. There was, essentially, a trial-and-error process he conducted leading up to the trip. That’s when he dialed in what equipment he’d need and what would be the best way to pack on the 40-total pounds of weight to his bike and self. At one point, his preparation included weighing down his bike with literal bricks. 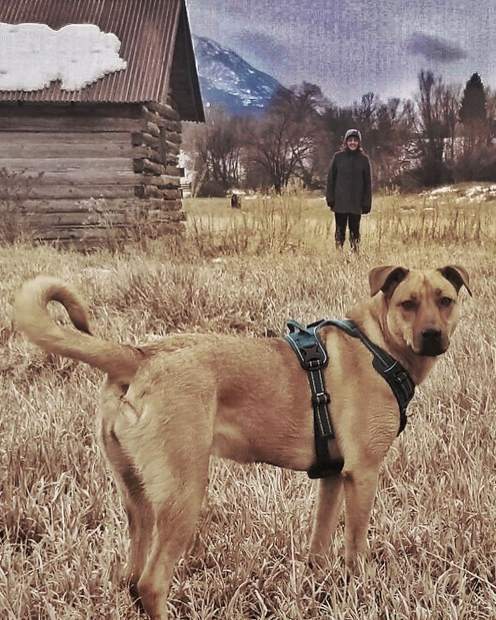 With that test weight, he hike-biked a portion of the Ten Mile Range with over 3,000 fee of elevation gain. “To figure out how to take weight off the bars for a little bit more control and put it in the frame bag around your back,” Husted said. 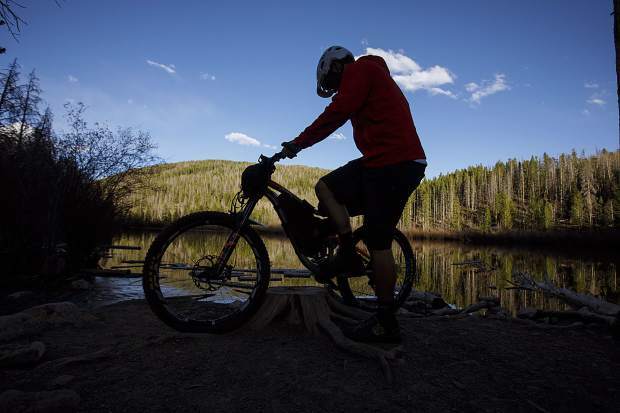 “… Just getting in line with all of your equipment and how the bike will feel when you’re on the trail. Packing light for the cross-Continental Divide bikepacking trip meant items like any extra clothes, aside from his riding and camping get-ups, would have to stay at home. Before the trip, Husted was keen on items he could use in multiple ways, such as a down jacket, which doubled as a pillow, among other things. 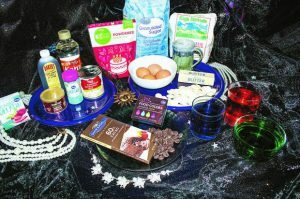 As for food, he planned out trips to grocery stores near the trail on most days, though he brought some lightweight, high-calorie freeze-dried food. 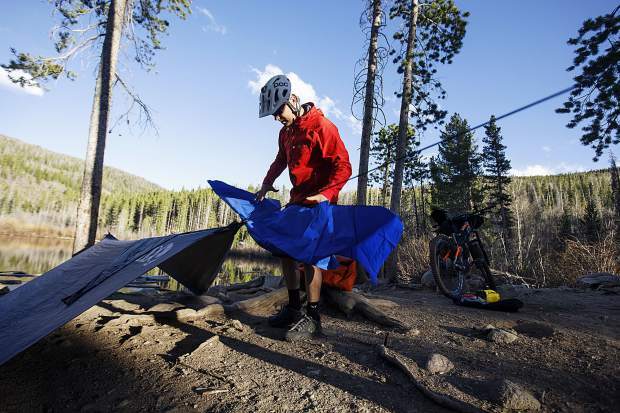 And with his trip late in the hiking and biking season, the Colorado Trail’s “Trail Angels” — like the man who restocks the cooler near Copper Mountain with beer — were no longer operating. In the end, everything aside from himself and his bike weighed 40 pounds. It all led him to his finish line: Durango. But after 10-plus days of exhausting bikepacking, it wasn’t an easy cruise down the homestretch. A couple of final uphills threw Husted a curveball, one that resulted in a slip-up where he biked off a cliff-edge ravine due to, as he put it, a “food bonk,” or a lack of energy due to a calorie deficiency. After he unhung his bike from a tree, he made it out of this final scare without any serious injuries. And his trusty bike in good shape, one last light, carbohydrate-filled artificial treat powered him to Mile 539. “A blueberry Pop Tart was the golden ticket to the end,” he said.